USE THE RIGHT TOOL FOR THE RIGHT JOB IN THE RIGHT WAY - USE FIDIC CONTRACTS! 1-day training (either 5th March or 8th March) - €250. ACEG members may benefit from 10% discount. Conference registration includes FREE COPY of the 2017 RED BOOK. 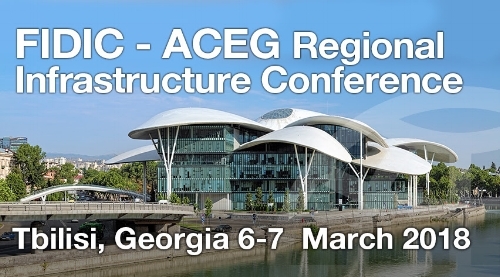 FOR PAYMENTS IN GEL - by bank transfer to ACEG by filling out the registration form below. It may be necessary for reasons beyond the control of ACEG and/or FIDIC to change the contents or timing of the programme, the speakers, the date or the venue. In the unlikely event of the programme being cancelled by ACEG and/or FIDIC, we will automatically make a full refund.